After countless trial runs, tiny tweaks, and plenty of bad batches [the worst of which were still plenty good enough to eat], we have finally arrived at granola bar perfection. They’ve been tested by family, friends, and acquaintances, all of whom have given two thumbs up. Mildly sweet with a hint of salt, these bars are the ideal balance of chewy and firm. From a roadtrip to North Carolina, to a day at the park, to our honeymoon, these have been our standby snack. They’re so good, we even get the occasional request to send a batch home to the folks. 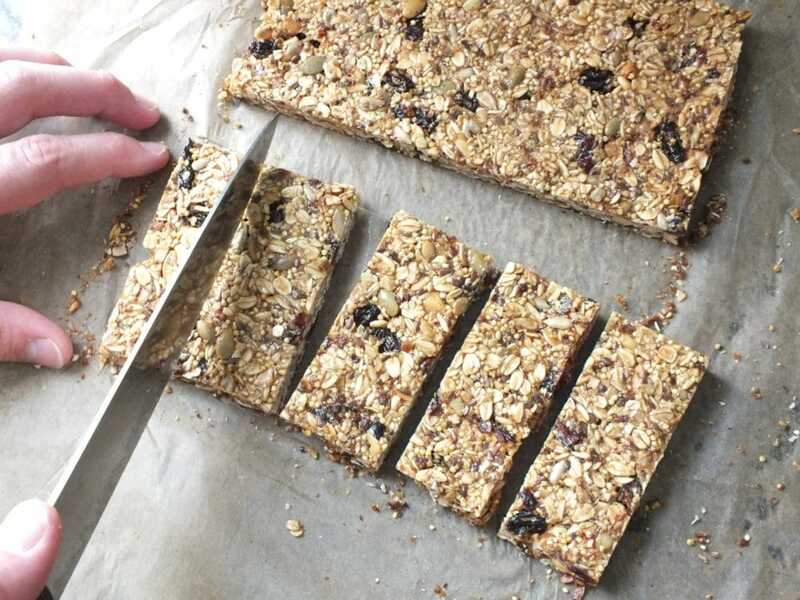 Sometime last year, we embarked on a mission to create the perfect homemade granola bar. We were hooked on Two Moms in the Raw at the time, so we were shooting for something roughly along those lines. Making a raw granola bar without a dehydrator is not the easiest task in the world, so we settled on baked instead. The first batch we made was too crumbly and gooey. When we tried to pick up one of the “squares,” it would fall over sadly and break in half. The second batch was an overcorrection. We tried to make them more firm and ended up with a brick of sawdust. Back to the drawing board. On our third try, we got closer to the right texture, but the taste wasn’t quite right. In this [highly scientific] recipe-testing process, we found that any amount of tinkering had a huge effect on consistency and flavor. So you can bet that it took way more than three trial runs to achieve granola bar gold. For a few weeks, our kitchen looked like the bulk bin section of Whole Foods had exploded: raisins, nuts, and seeds e-v-e-r-y-w-h-e-r-e. All of the research and development was worth it. Now we have the best snack ever, just chilling in our recipe box, ready to be whipped out for our next adventure. The list of ingredients is extensive, and for good reason. Each granola bar includes multiple kinds of fiber and protein from the nuts, seeds, and grains. They equal out to 215 calories, 5.5 grams of protein, 4.5 grams of fiber, and provide over 15% of your body’s daily iron and Vitamin A needs. Every ingredient is essential to the flavor and texture, both of which are perfect. This recipe is incredibly easy to make — it takes less than 45 minutes from start to finish! And it makes enough to snack on for days or weeks. The ingredients are all easy to find in the bulk section of most local health food stores or Whole Foods. Since we make them fairly often, we keep everything on hand so we always have what we need to make a batch. 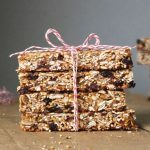 Chewy, crunchy and loaded with healthy grains, dried fruits, and flax, these granola bars are the absolute best homemade option. Mix all ingredients except apricots, brown rice syrup, peanut butter, coconut oil, and raw honey in a large bowl. Food process apricots until they ball up. Add brown rice syrup, peanut butter, coconut oil, chopped apricots, and honey to a sauce pan. Heat mixture over med/low heat. 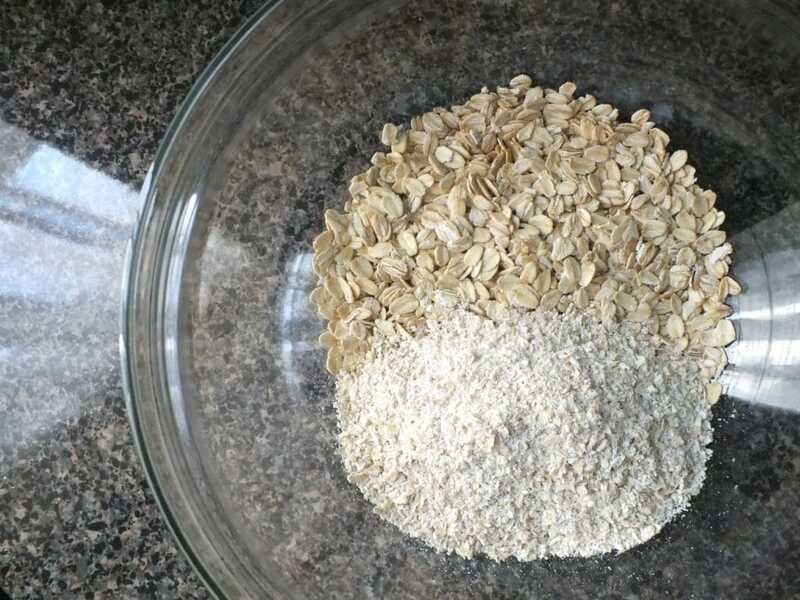 Add heated wet mix to dry mix. 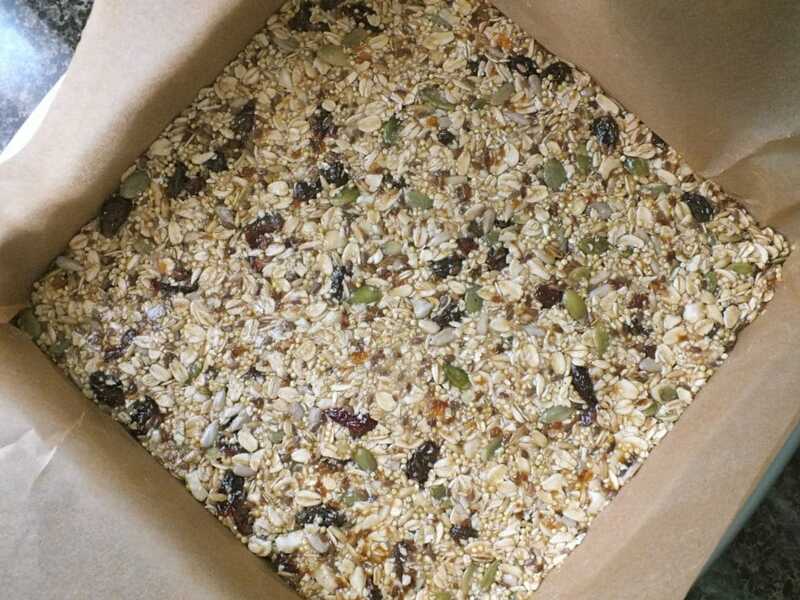 Line an 8×8 pan with parchment paper and add granola bar mixture. Flatten with hands or rubber spatula. Bake for 25 minutes. allow to cool before cutting. 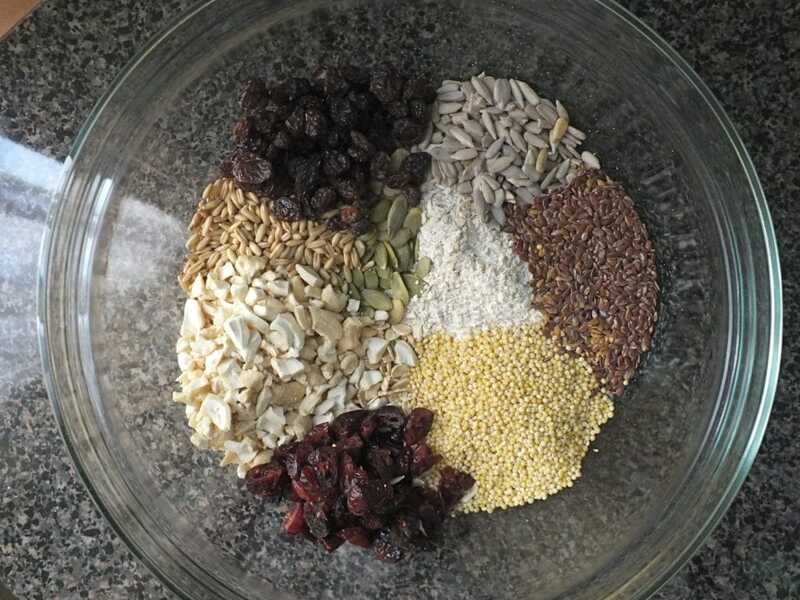 I just finished my raw granola recipe that contains most of your ingredients, except oat groats, millet, and rice syrup. However, they won’t stay together so I keep in freezer or fridge. Anyway I got online to find some ingredient that others are using to make them stick together. I’ll I to try yours. Mine even look like yours!!! Thanks for posting and I’ll check out some of your other recipes also! These are fantastic! 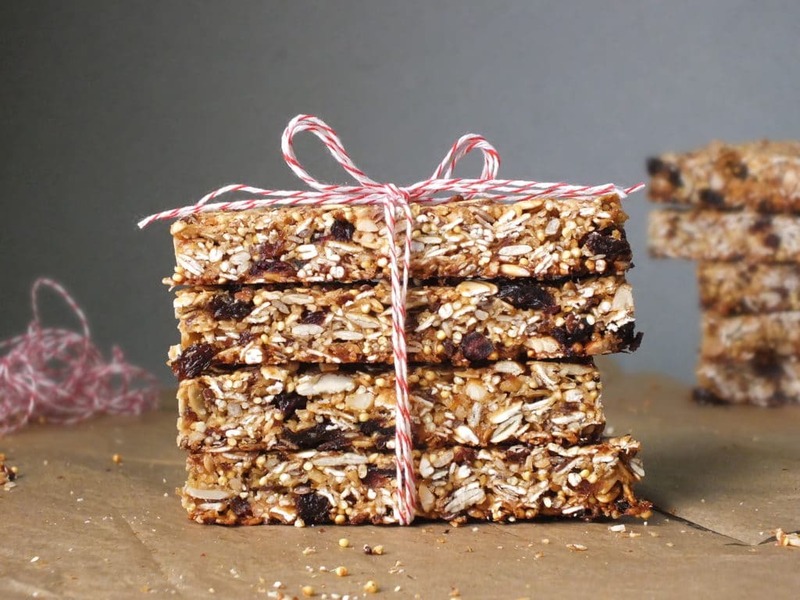 I have been looking for a granola bar recipe that doesn’t fall apart for soooo long. Bonus that they don’t have flour, sugar, eggs, butter. Hope to test them hiking too. Thankyou! It’s called whole grains. They’re healthy and tasty. 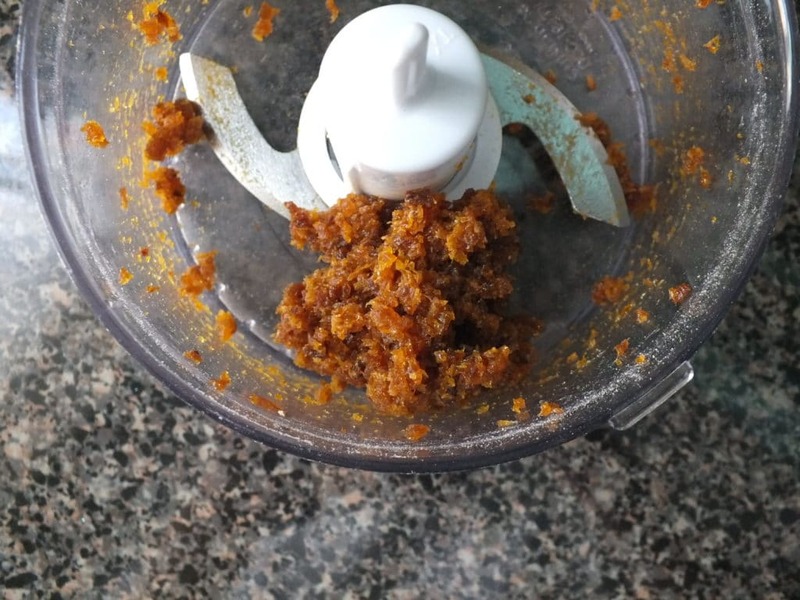 So…I have never made anything like this before, but im trying to get to a healthy weight and was looking for some granola bars to cook up in my dehydrator. 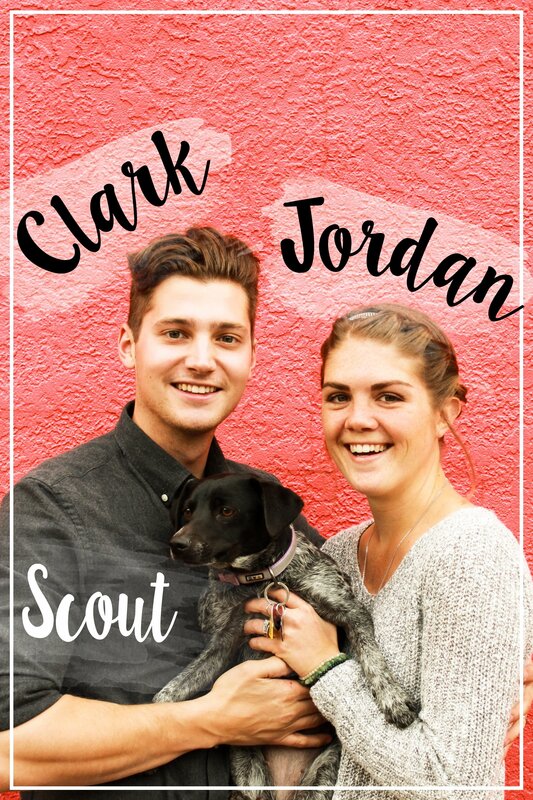 I cam across this recipe and was skeptical because im not a nuts and bark kinda gal lol. I was afraid it would taste like nothing and not be sweet enough for me. I was so wrong, these bars are perfect. They are just the right size and their density is just enough to tide you over as a great breakfast (i enjoy mine with a banana) or a snack at work. They are so full of great rich seeds and grains that it has a great flavor, great texture (the groats are a must!!) and just all around is awesome. not to mention its full of real, wholesome ingredients. Even my boyfriend approves and i never in a million years thought he would even try it. so if youre skeptical as i was, take the plunge. if youre worried about price they were actually very cheap for me to make. i went to WholeFoods to the awesome bulk section and got most everything i needed without trouble (including their bulk honey, and the things id never heard of!). and the rest i found in relatively cheap packages. The most expensive thing i had to get was a jar of the brown rice syrup at $5. but theres enough in there to last me many many batches. overall its an excellent recipe, and i thank you for posting it! I see you store them at room temperature, about how long will they last? Great recipe! Thank you! These are fantastic. Our first venture into making our own and we may never buy store bought again. Very easy to make, don’t take much time either. Thank you for a great recipe! Do you think you could replace the brown rice syrup with coconut nectar, molasses or something similar? That’s a great question! I’ve never worked with coconut nectar. If the consistency is similar, I think it should work just fine. Let me know! Well, on a normal run-through, our ingredients bowl doesn’t look so neat. ;) Report back with how you liked them! What could the gluten intolerant use instead of oat groats?? How about puffed rice Lucy?